Ojos Azules are a relatively new breed of domestic cat. Cats with dark blue eyes were discovered in New Mexico among feral cat populations. The first cat, discovered in 1984, was a tortoiseshell named Cornflower. She was bred to males without the trait, which proved to be dominant, as all her kittens showed it. The breed was founded and named Ojos Azules, Spanish meaning 'Blue Eyes'. Ojos Azules are remarkable for their deep blue eyes. Unlike the blue eyes seen linked to the genes in bicolor cats and cats with point coloration, both of which suppress pigmentation, this gene is not linked to any certain fur color or pattern, giving the opportunity to have cats with dark coats and blue eyes. The depth of color in the eyes is greater even than that seen in a Siamese (cat), and does not cause squinting, deafness or cross-eye. Ojos Azules are a very rare breed. In 1992, only ten were known. The breed, in both short and long hair variety, was accepted for registration by TICA in 1991. The TICA Ojos Azules Breed Group Standard is dated 5 January 2004. Only cats expressing the deep blue eye gene have been called Ojos Azules. It was recently discovered that cranial defects may be linked to the gene, and breeding was temporarily suspended. Following genetic investigation by Solveig Pflueger, breeding resumed in a small way with attempts to breed Ojos Azules without the lethal genetic defects. It was discovered that when the gene is homozygous it causes cranial deformities, white fur, a small curled tail, and stillbirth. However, when the gene is heterozygous, those lethal genetic mutations do not manifest. 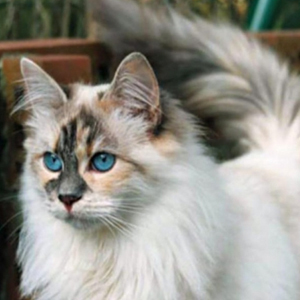 The result is that breeders must cross the blue-eyed cats with non-blue-eyed cats, assuring a litter of about 50/50 blue/non-blue-eyed kittens. Though only half of the kittens are then part of the Ojos Azules breed, this avoids having much of the litter comprise deformed dead kittens. One indicator of the Ojos gene is a flattened tail-tip. Although the eye color is described as having depth "even greater even than that seen in a Siamese" it, in fact, does not. The blue color seen in cats is due to the same physical phenomenon, the absence of melanin in the iris. The cause of the absence of pigment differs between Siamese, white cats, and Ojos but the end result is pigment loss and blue eyes. The depth of color of the blue eyes is due to currently unknown polygenetic variations. The depth of eye color can be selected for in breeding programs and current show Siamese have extremely deep eye color.